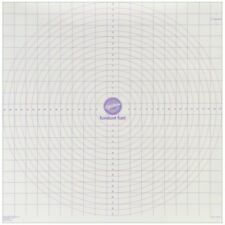 Wilton Roll and Cut Mat Fondant Dough Measured Grid Cutting Board 20 X 20"
Wilton Roll N Cut Mat Features Non Stick Surface 20x20 For precise measuring, rolling, and cutting of fondant or dough For precise measuring rolling and cutting of fondant or dough. 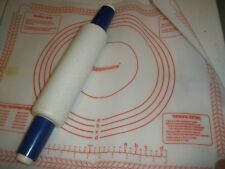 Pre marked circles for exact sizing. Square grid helps you cut precise strips. Non stick surface for easy release. Rolling pastry, bread and cookie dough more easily than ever before, making cooking and baking a breeze. Pastry Mat. - Easy to roll the dough to intended thickness. Leg Stretcher, Door Flexibility & Stretching Leg Strap - Great for Ballet Cheer. Dishwasher safe. Doubles as a baking sheet liner. Silicone is high heat resistant to 450F/235C. Stainless steel rolling pin for safer and more durable. Folding Hair Brush Pocket Comb With Mirror Set Mini Travel Compact Foldable Gift. The pastry frame allows thinner dough roll out with out sticking. 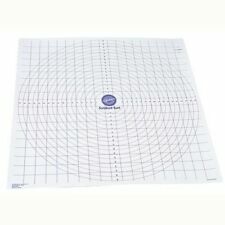 Multi-purpose mat is ideal for rolling out dough, slicing, dicing and chopping. Paul Hollywood Bakeware 43cm Solid Wood Pastry Rolling Pin & Measuring Guide. MIU France 8-Piece polyethylene flexible cutting boards. Four full size boards: orange, yellow, blue and green. The flexible boards curl easily to transfer chopped food directly into the bowl, pot or pan. Baking Mat. Non Stick Rolling Pin With Ball Bearings. Rolling Pin. For Even And Effortless Rolling. 2 Piece Set. Pastry Sheet Mat. Fill & Chill Blue Handled Rolling Pin. Mastrad Large Silicone Pastry Mat / Baking Sheet - 24" x 15.75"
Three uses in one: Preparation, Storage and Baking! Makes rolling out piecrusts and cookie dough a breeze. Then bake your pastries and preparations right on the mat! Constructed from fiberglass reinforced silicone which is both flexible and very durable. Chefast Non-Stick Rolling Pin and Pastry Mat Set Combo Kit of Large and Small. I will work with you to make things right. Every item is thoroughly inspected and tested unless it is factory sealed or new unopened! Non stick surface for easy release. 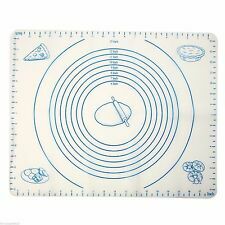 Non-Stick Silicone Rubber Baking Mat with Measurements for Pastry Blue 20"X16"
HEAT RESISTANT Baking Liner. It withstands temperatures from -40 degrees F (-40 degrees C) to 450 degrees F (230 degrees C), so you can take the pastry mat out from the freezer and straightly to the oven or microwave. Silicone Rolling Pin - Red. Made from non-stick, heat resistant silicone. Slip-free grip for a safe and comfortable use. IF YOU OUTSIDE UK. Mastrad Small Silicone Pastry Mat / Baking Sheet - 15.75" x 11.75"
TWO ONLY Silicone Baking Mat X-Chef Non-Stick Silicone Rolling Mat -16.5" * 12"
This large, silicone pastry mat provides a hygienic, non-slip surface for preparing all kinds of pastry and icing. Pastry making has never been so easy or fun with the Roll-Up Pastry Mat. Dishwasher safe. Used but very useable still. Just flour residue. It's pre-seasoned! Great for cookies, candies, and pastry dough! Non-Stick Silicone Rubber Baking Mat with Measurements for Pastry Pink 20"X16"
Non-slip 100% food grade silicone pastry, dough and pie crust mat. Professional, extra-large 24"x24" size. No need to worry about rolling your dough, fondant or pie crust off the mat and onto your counter. An attractive kitchen essential, this Stainless Steel Rolling Pin easily rolls dough and makes cleanup simple. Durable design features a stainless steel rolling piece and sturdy plastic handles with holes for easy hanging. Casabella Orange Silicone Standard Baking N Pastry Mat. Safe to 675 degrees. Dishwasher, microwave and freezer safe. Can be cut to size. Type Rolling Mat. Casabella Orange Silicone Standard Baking N Pastry Mat. Safe to 675 degrees. Dishwasher, microwave and freezer safe. Can be cut to size. Easier for Baking?. After done kneading, just wash them with water. - Rolling pastry, bread and cookie dough more easily than ever before, making cooking and baking a breeze. Premium Quality?. This rolling pin is made of 100% food-grade stainless steel. Manufacturer: Chefast. TWO IS TWICE AS NICE: We include a traditional 17” as well as an 8.5” rolling pin to enable you to tackle large and small jobs equally well. Both rolling pins include wooden handles and a non-stick silicone dough roller for maximum comfort and ease of use. Rolling Pin with Thickness Rings and Pastry Mat Set, Adjustable Rolling Pins for Baking Cookie Chapati Fondant Dough Pastry Pizza Pie Crust, Stainless Steel Roller Pin. After done kneading, it is very easy to clean. Rolling Pin - Usparkle Nonstick Silicone Rolling Pin 16.9" - Thick Large Silicone Pastry Mat 25" X 17" for Baking and Rolling Dough - Silicone Spatula Silicone Cream Brushes. Manufacturer: Usparkle. Manufacturer: Inkec. ♥【BAKING HELPER】If you are looking for a rolling pin and baking mat to make biscuits, cookie, bread, pizza, pie, tarts, dumpling, pasta, or other foods, our rolling pin and pastry mat would be your perfect choice. Quellance Stainless Steel Rolling Pin - Your perfect kitchen cooking helper?. A great little gift for those that love to cook or bake Don't hesitate to open your new cooking experience with Quellance Stainless Steel Rolling Pin! Doubles as a baking liner and promotes even heating. Silicone is high heat resistant to 450°F / 235°C. FDA approved. Dishwasher safe. Manufacturer: Norpro. Silicone is high heat resistant to 450F / 235C. Rolling Pin, Adjustable Rolling Pin with Pastry Mat, Rolling Pin Spacers French with Mat, FDA Approved, Cookie Dough Roller Mat Stainless Steel Rolling Pin Spacers French for Baking Cookie Dough. Professional durable brushed stainless steel rolling pin, smooth and heavy stainless steel surface effortlessly presses the dough without sticking. After done kneading, it is very easy to clean. Easy to knead dough to the intended thickness for a novice or an old hand. Elegant and stylish, high grade satin brushed stainless steel finish for a long life; No rust! WahCaak Rolling Pin Fondant Kit - Adjustable with Non-Stick Pastry Mat and 3 Removable Rings for Dough, Baking and Cookies, FDA Approved. You can also remove all the rings to roll the dough as you need.